Great Spring And Summer Rates Right on the BEACH!!!! has everything you need on a vacation. enjoy the ocean view and watch the dolphins while drinking your coffee. The living room has a queen size sleeper sofabed. Remote control New Flat Screen TVs in bedroom and living room. The kitchen has a Refrigerator, Microwave, Toaster, Coffee Maker, Pots and Pans, all utensils, towels, and linens. 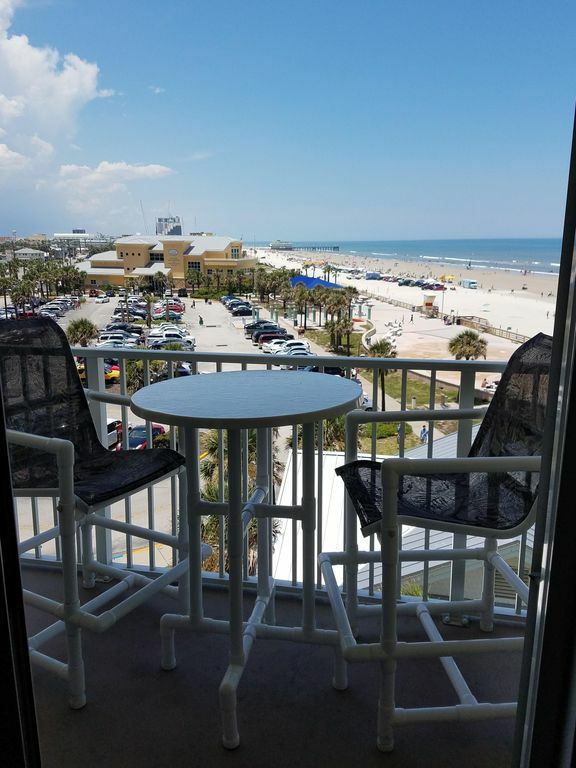 This condo adjoins an oceanfront park with covered cook-out tables and a children's splash park with a play area. This unit is a No-Smoking, No-Pet Condo. BOOK EARLY THIS UNIT RENTS FAST. A bathroom with a shower and tub combo. You can sit on the very large private balcony and watch the dolphins in the ocean. Its a beautiful view witch you can see in the pictures. Yes, I have linens provided in the unit. Right outside your Condo is a Washer and Dryer that are Coin Operated. One Spot per unit ONLY with a parking pass. I have towels provided in the unit. In the Lobby Area there is a Exercise Room. Yes there is a toaster , I also have crock pot, George foreman. There are plenty of dishes and utensils for you to enjoy your meals in. Built in Bar for eating and watching the dolphins in the Ocean. Located off the Lobby area. Yes, you have a private balcony right outside your living room. Daytona Beach Golf Club is located a few miles from the condo. The Largest pool in Daytona Beach located right on the beach. The hot tub is located on the pool deck. Queen size bed Queen size sofabed 2 Cable TVs with HBO and , DVD Kitchen stove Refrigerator Microwave Toaster Linens Towels Dishes Phone George Foreman Coffee Pot 2 AC and Heating Units Exercise Room Available The largest pool in DaytonaBeach with a Hot Tub. There is an ice machine and coin operated washer and dryer available. We were able to walk everywhere and had an awesome view of the beach! This condo had a wonderful view of the ocean and easy access, plus a great pool that we didn't use. It is small, but who spends much time inside! Loved our week at this property! We had a very relaxing and wonderful stay at this property. Very roomy and clean with everything we needed for our week stay. Would definitely stay here again. This was the best vacation we have ever had in Daytona. The condo was perfect for us. It was clean and had everything we needed. The view from the balcony was awesome. The owners were very quick to respond and very nice to work with. The pool area was clean and very relaxing. There was no noise in the hallways and laundry very convenient. Definitely want to book again for next year. rooms, Rides, Minature golf, go-carts, and Shops. There are quad and golf cart rentals on the beach. Main street is only 1 mile away for bike week activities. Disneyland and other Orlando attractions are a 1 Hour drive. Historic St. Augustine is just 45 minutes away. The condo is only 45 min. from Cape Canaveral. Call for additional Dates and Prices!! Guests must be 21 years or older to reserve this condo There is a $200.00 refundable security deposit on unit.